5X09 OMG! OMG!. . HD Wallpaper and background images in the 亚瑟和格温 club tagged: angel coulby bradley james arthur gwen. KISS HER!!! KISS HER!!!! KISS HER!!!!!! Now this is interesting indeed! Oh God, this better lead to something good!! Shake her to her senses Arthur!! ....but this looks like pre water purging.. In a perfect world Gwen will jump, almost drown, Arthur will save her, carry her in his arms, plant a BIG one her, they embrace as the Arwen theme finally plays in the background... in a perfect world. Hey! I hadn't seen this! Boy do I miss the violins and the sunlight. But this does look interesting. I'm ready. "But only the most powerful magic can save the Queen"
Truth be told, the most powerful magic in the world, saved him once. It is time for Arthur to return the favour. ^They wouldn't give us that would they. We so desperately need it to be that. Especially at this point. I think Merlin may really have to use magic for this one. In 2x10 the true love's kiss was based on the most powerful "force" being love, not the most powerful "magic". So, I think maybe it's Merlin using a different kind of magic to release her from Morgana. I actually want him to really start to one up Morgana in the magic department. I have no idea what's going on in the photograph but looking forward to finding out. Can't wait to get home so I can properly study this shot. Lets hope there is an arwen moment ! There wasnt even a hug whilst gwen was hysterically crying after the death of her brother! Previously like in lamia for instance he rushed up to her and hugged her madly ! Such an intense capture. Hopefully we will see some "inner" struggle with her trying to come out of the enchantement's hold. He looks like he's pleading with her, begging her....I cannot wait to see this episode!! If we don't get at least one moment in 5x09 I will be seriously shocked. This looks like it is pre - drowning, although her hair looks slightly damp so I can't be sure. OMFG I CANT WAIT,BRING IT ON AND WE BETTER GET A PASSIONATE KISS. Please let it just be them. 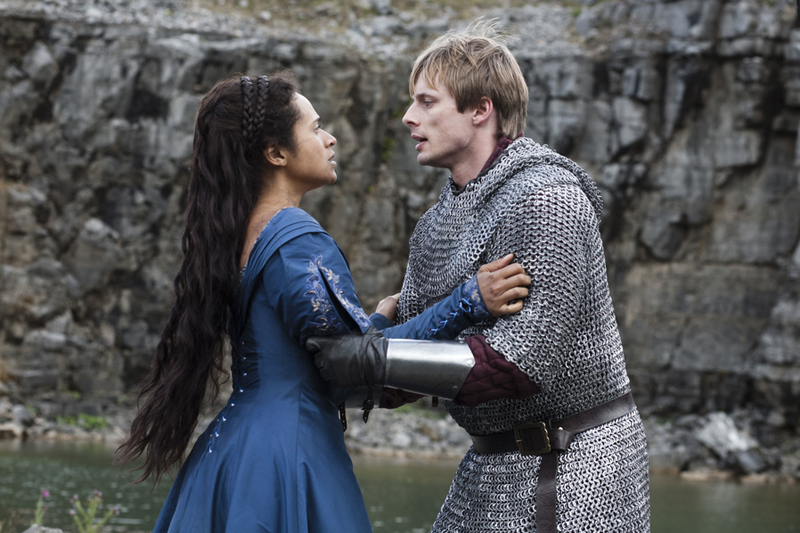 At least he pulls her out of the water and not Merlin. I'm not going to allow myself to hope for anything specific. I'm just going to enjoy this picture knowing that something big is happening here to my Arwen. So glad they released this! Probably on purpose because of all the outcry they've been getting about the lack of Arwen. HQ and finally you are thinking strategically, they fucked up big time with the tweet and they are trying to counter their own stupidity instead of firing the chimpanzees they have hired who man the tweets. @Stacey. Probably they didn't have the time to know the consequences of the tweet and FB when they released this but did know some of the static being heard around the net even prior to that. Because they are idiots and do not think , which is why their professionalism has stunted the entire show actually. Stacey, I think you just insulted chimpanzees. Look at Gwen's hair, it's wet. But the producers screwed up an put her in a DRY dress to film this scene. Obviously Arthur knows his queen is enchanted and he's fighting to get her back. I think the power of love is going to be what breaks the spell. Remember the base of the spell was to convince Gwen that NO ONE loved her. When she resisted, Morgana killed Elyan to make Gwen vunerable to the brainwash and the enchantment. Arthur and Gwen will reunite. Geez Morgana, always underestimating her opponent. She expects Arthur to behave like Uther under certain circumstances. You know Morgana was counting on Arthur to execute Gwen when she set her up for adultery, and that backfired when Arthur married Gwen. When you shop at the ACME Spell Emporium READ THE FINE PRINT of the hex, hoodoo, or whatever you pick up. I think you're right. I think they messed up with the dress because definitely their hair has been wet. His too. This is true Kim, this is true. HMGwen...you rock, kiddo! Continuity has never been a strong point, kids. And lol at HMG. Morgana shops at the same stores as Wile E. Coyote. @April80s mate how are ye? I am sadly hanging the flip on however as a bloody whole meh has given up. I went back to first love Arwen and Merlin, thanks for the warm comment meh tries mate. How ye been? i cant wait for this!!!!!!!!!!!! LOL @ Morgana shopping at the ACME Spell Emporium. Explains why all her schemes end up blowing up in her face. WOW!!! This looks like a goodie episode and I can't wait to see what happens because I'm slightly confused at the moment?!?!? Can someone pinch me??? To HumbleQueen if merlin pulled her out of the water I would have cried and then get furious!!!! But god I can't wait for this episode!!!! 14 days to go!!! Let the countdown begin! So excited for this episode. I need my Gwen back. I do hope that Arthur's love breaks the spell, just like she did in Sweet Dreams. I only disagree with one thing: Neither her nor his hair are wet to me. So, I believe this is before she enters the water. OMG OMG OMG OMG Can not wait for this episode The power of love should totally break the spell. And the water scene will be a nice touch to this plotline. Can not wait until this scene!!!!!!!!!!!!!!!!!!!!!!!! Am sooo exited that I cant even put my exitment into words. But one question puzzles me. . . If this scene takes place before she tries to drown herself (which it most likely does because Arthur nor Gwen is damp or wet meaning they have not been in the water at all yet) how does she even get the chance to enter the water let alone try and drown herself with Arthur standing right there?? Any theorys??? Maybe their hair isn't wet. I thought so at first but after seeing the trailer it looks as though he runs over and grabs her while she's with the old!Morgana. She definitely gets drugged somehow and they're carrying her around in that state. Which I'm glad it's Arthur who's carrying her so he's a part of the whole thing. I would hate it to be Merlin doing everything while Arthur back at the castle. That's the way they usually do it. One theory is that they let her go into the water because there's some magical reason she needs to. That's what I was thinking, too, about the water. So it's probably not what happens, lol. @HQ: That actually isn't old!Morgana. It's Merlin disguised as an old woman. I don't even know how he's gonna pull that off while Arthur's there. Like is he going to just disappear, change into that old woman and then reappear with no one questioning where he was? Re their clothes, they probably didn't want the actors working in wet clothing for a prolong time, you know how long it takes to shoot a scene. BB what are talking about here, is there another pic with Merlin in drag, I haven't seen it. Wait. . . What?? Merlin discised as an old woman????? How does that fit in the picture? That does not make sense. I am very interested in how this plot line is going to turn out. Merlin an old woman, Morgana falling through the air (trailer), Athusa, Gwen drowning herself in a lake, getting Gwen back to normal (de enchanted), Gwen fainting on a cream puff Merlin puts under her (trailer) soo much soo much. How will it turn out?? Soooooooo do not want to wait until SATURDAY. So anxious to see it. This is indeed suspenseful! So that old lady is MERLIN! Whoa, now this is really getting good! I've got to go and catch up on my spoilers....been out too much, lol. I think Merlin is going to have to kill the Drocha as he has Excalibur wiping blood during the scene but this is a guess. I think the strongest power of all is Love as it is said so much in this series. Sort of like how Gwen had to kiss Arthur to break his enchantment in the earlier season with Vivian, I think Gwen's love for Arthur will be the deciding factor to break this enchantment over herself which Arthur is going to have to intervene in as Morgana is fueling her hate. This is just my thoughts. I am so looking forward to this episode.